The steps to compare two designs with SDMetrics are as follows. Calculate the metrics for the first (or older) design to compare as usual, as described in Section 4.3 "Calculating and Viewing Metric Data". In the topmost text field of the design comparison view, specify the XMI file with the second (or newer) design to compare. If supported on your platform, you can also drag and drop the XMI file anywhere in the design comparison view. Press the button next to the text field where you specified your second model. This will calculate the metrics for the second design, and the metric deltas to the first design. The design comparison view provides two sets of tables: metric deltas and descriptive statistics. By default, the tables show the difference of measurement values between the first and second design (value in first design minus value in second design). To show the relative difference of the value in the second design as percentage of the value in the first design, select the "Show relative deltas" radio button next to the element type dropdown list. 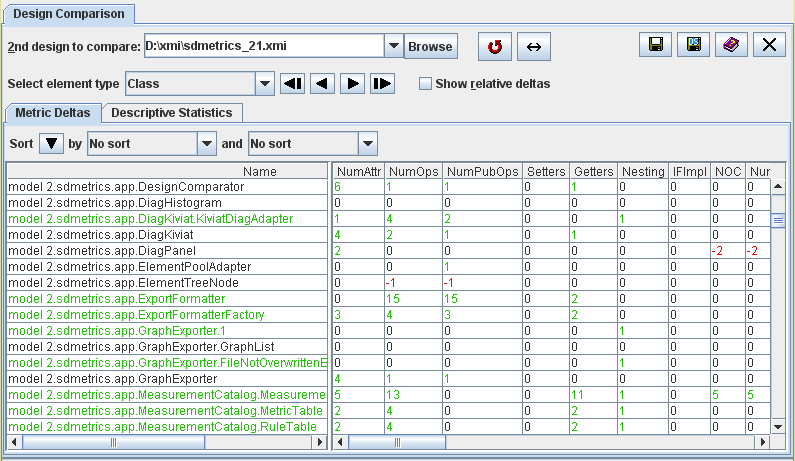 The context menu of the right hand side table links to the detailed definition of the selected metric in the measurement catalog (see Section 4.13 "The View 'Catalog'"). Section 4.9 "The View 'Design Comparison'" Contents Section 4.9.2 "Metric Deltas Table"